A couple of the better speakers, including Chris Hedges, seems to have been left out of the videos but still there are several you can watch. If the attendance last night was any measure the event today should be well attended. Things begin at noon with 20 speakers at Lafayette Park, across from the White House, to be followed by a solemn march to the White House fence where we will refuse to leave and then likely be arrested once again. The U.N. has now given NATO the authority to begin bombing Libya. Don't think for a minute that this will be a short-term campaign. Expect NATO to ultimately say they must "put bases" into the North African country in order to bring stability and democracy. But don't be fooled by that. 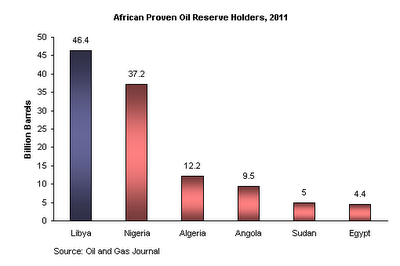 This is all about Libya's oil. France said it was prepared to launch attacks within hours, and Britain also indicated that it was prepared to act quickly. Initial strikes are likely to target air defense systems and runways; it was unclear whether plans were also in motion to strike at tank columns and other government ground forces headed east. U.S. officials said that it would probably take several days for a full operation to be undertaken and that President Obama had not yet approved the use of U.S. military assets. Obama has preferred to let other nations publicly lead the response to the Libyan crisis, and White House officials said he would not appear on camera Thursday night to speak about the U.N. vote. At a Senate hearing Thursday, Undersecretary of State William J. Burns confronted sharply differing views about the Libyan crisis that crossed party lines. Some, led by Sen. John F. Kerry (D-Mass. ), said the administration has been too cautious in its response. “Time is running out for the Libyan people,” Kerry said. But Sen. Richard G. Lugar (R-Ind. ), along with several Democrats, warned of the “risk that our involvement would escalate” and said the administration should “seek congressional debate on a declaration of war” against Libya before U.S. forces participate in any action. 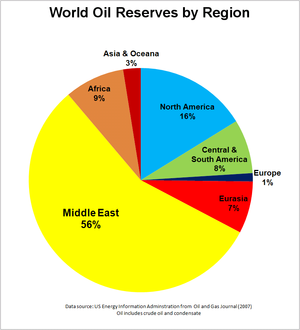 Using NATO (which is a military tool of the U.S. empire) as cover it is likely that once Gaddafi is taken down from power in Libya a puppet government will be installed that will allow the U.S. and British oil corporations to take control of the black gold. Eventually the people of Libya, who are demanding and deserve freedom, will discover that they have been betrayed by a NATO command that is more interested in oil profits than their hopes and dreams. At that point the real revolution will begin but by then NATO bases will likely have settled onto the dusty lands of North Africa. I am reminded of the words of Thomas Barnett, who during the Bush II administration was described as Donald Rumsfeld's "strategy guy", speaking to an auditorium full of high-level military brass and CIA operatives and saying, "In 20 years we will be fighting in Africa for their oil." It appears that Barnett's prophecy is running ahead of schedule. I am heading to Washington DC with some friends early in the morning by train. 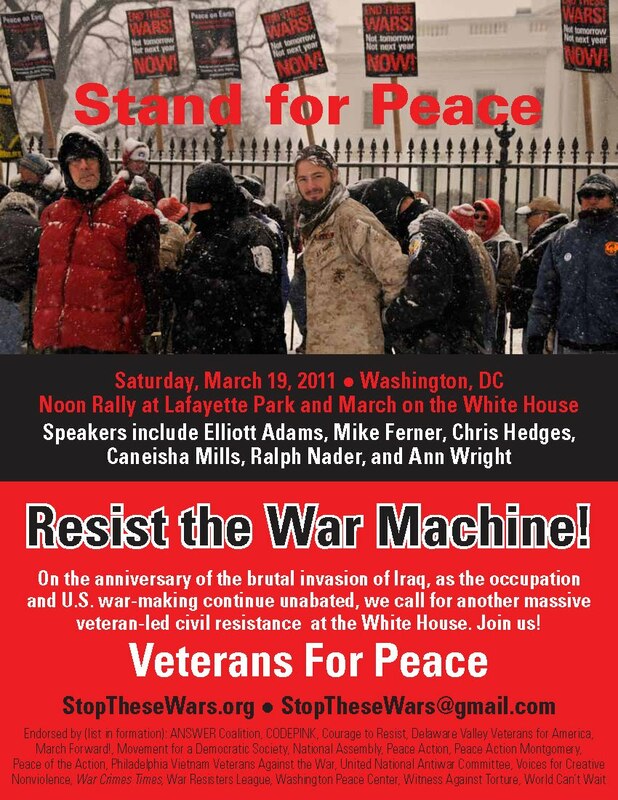 We are going to join the Veterans for Peace protest at the White House opposing endless war. As I type this the House of Representatives in DC is finishing debate on the Kucinich resolution calling for a pullout of troops from Afghanistan. Looks like they have delayed the final vote on the resolution until later in the day. I'll have to do an update then. 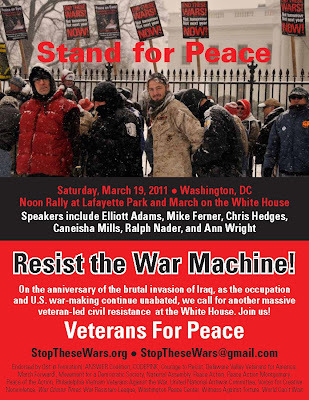 There will many local anti-war protests across the country on March 19 - it's good to see folks cranking it back up again. God knows we need to make the case that war spending is killing us at home as we continue to plunder and slaughter innocents in Iraq-Afghanistan-Pakistan. Bring Our War $$ Home now! The interesting thing is just before the Afghanistan vote, the House voted 228-192 to defund National Public Radio. All the Democrats voted against defunding NPR. You have to wonder where they figure they would get the $$ for NPR as long as their party supports spending $170 billion a year on endless war in Iraq-Afghanistan-Pakistan. The time for non-violent resistance to this madness is upon us. The report on the crack of the #3 reactor came from the U.S. NRC, which has made it quite clear that the Japanese Government and Power Company are not telling the truth. Based upon prior performance, the U.S. NRC is not telling the truth either. So my guess is that the disaster is far more serious than the Governments of USA and Japan are letting on. A Crime Against Humanity. My guess is that the USA has a sophisticated spy satellite parked right over the nuclear disaster site and knows exactly how serious it is. The politicians from both parties in the U.S., fearing the public will get emotional and out-of-control, are continuing to reassure us that nuclear power is safe and necessary. I heard one last night say nuclear had to be included in the energy basket because there were not any other choices beyond oil and coal. Never a word about wind or solar or conservation. But the pictures coming out of Japan tell another story. They speak of fear and disaster and inability of politicians to contain this mess. It appears that no one in Japan (or their "expert" advisers in the U.S.) know what to do next. If I had the ear of the Prime Minister, I would recommend the "Chernobyl Option." •Assemble a huge fleet of helicopters. Put shielding underneath them. •Accumulate enough sand, boric acid, and concrete to smother these reactors, to entomb them forever. This is what the Soviets did in 1986, calling out the Red Air Force and sandbagging the reactor with over 5,000 tons of concrete and sand. 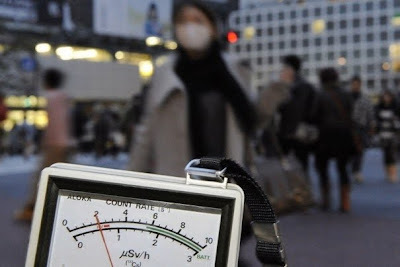 NHK [Japanese] news has just reported that the Ministry of Health and Welfare raised the permissible radioactivity level for NPP workers from 200 milli seivert to 250 milli seivelt. Isn't this breach of human rights? A violation of the Nuremberg Code on Medical Experimentation and thus a serious international crime? Boyle is calling for an international movement to challenge all nuclear power plants (present and future) as a violation of human rights. I think he is absolutely correct. The villagers have just got a small victory by getting the Island Council’s resolution reversing cancellation of the previous Island council’s past bill on the annulment of absolute preservation areas in their village. The ex-Island council had passed the bill in snatched way in Dec. 2009 and it became the legal pretext for the Navy to enforce the Naval base construction that the villagers oppose. After the Jeju Island council’s March 15, 2011 vote was passed, the villagers and civic organizations gathered in delight, being proud of their first victory after nearly four years’ hard struggles, in front of the Island council. More difficult fights are still to come as this new resolution will not stop the Navy base construction by itself but could help in the legal action that is still underway. Mayor: We/ People: Can do it! Mayor: We/ People: Did it! Mayor: The persistent/ People: will win! Mayor: Naval base/ People: absolutely No! "This is beyond serious," Harvey Wasserman of NukeFree.org says of the situation surrounding Japan's damaged nuclear facilities. "If all four of those reactors go, the death toll will be in the millions." STOP RELYING ON THE "EXPERTS"
The news from Japan seems worse each day. Problems are spreading at the Fukushima nuclear plant as fires have broke out in reactor #4. The Japanese government appears to be down playing the danger to the public about spreading radiation contamination. Protests in Germany and France are building against their nuclear power industry. In the U.S. Obama continues to promote nuclear power in spite of events in Japan. Investors in the nuclear industry are getting a bit skittish though as they fear they'll lose money if the world's public turns against nuclear power. It's crazy that governments are putting the people at such risk....we have to stop relying on the so-called "experts" who keep telling us that nuclear power is safe and clean. Nearly two-thirds of Americans now say the war in Afghanistan is no longer worth fighting, the highest proportion yet opposed to the conflict, according to a new Washington Post-ABC News poll. The number of respondents to the Post-ABC News poll who say the war is not worth fighting has risen from 44 percent in late 2009 to 64 percent in the survey conducted last week. It is obvious that the public is increasingly understanding that the nation can't afford to keep paying for war. While the country might be divided on many issues it is clear that when it comes to endless war the people are largely united in opposition. These numbers should reveal to even the most timid that calling on Obama and Congress to Bring Our War $$ Home resonates with the public. Workers in this country paid for their rights by suffering brutal beatings, mass expulsions from company housing and jobs, crippling strikes, targeted assassinations of union leaders and armed battles with hired gun thugs and state militias. The Rockefellers, the Mellons, the Carnegies and the Morgans—the Koch Brothers Industries, Goldman Sachs and Wal-Mart of their day—never gave a damn about workers. All they cared about was profit. The eight-hour workday, the minimum wage, Social Security, pensions, job safety, paid vacations, retirement benefits and health insurance were achieved because hundreds of thousands of workers physically fought a system of capitalist exploitation. They rallied around radicals such as “Mother” Jones, United Mine Workers’ President John L. Lewis and “Big” Bill Haywood and his Wobblies as well as the socialist presidential candidate Eugene V. Debs. 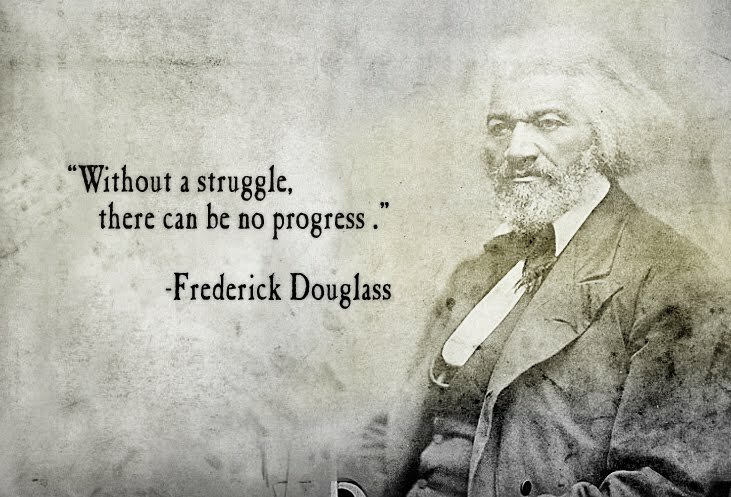 Those who fought to achieve these rights endured tremendous suffering, pain and deprivation. It is they who made possible our middle class and opened up our democracy. The elite hired goons and criminal militias to evict striking miners from company houses, infiltrate fledgling union organizations and murder suspected union leaders and sympathizers. Federal marshals, state militias, sheriff’s deputies and at times Army troops, along with the courts and legislative bodies, were repeatedly used to crush and stymie worker revolts. Striking sugar cane workers were gunned down in Thibodaux, La., in 1887. Steel workers were shot to death in 1892 in Homestead, Pa. Railroad workers in the Pullman strike of 1894 were murdered. Coal miners at Ludlow, Colo., in 1914 and at Matewan, W.Va., in 1920 were massacred. Our freedoms and rights were paid for with their courage and blood. American democracy arose because those consciously locked out of the system put their bodies on the line and demanded justice. The exclusion of the poor and the working class from the systems of power in this country was deliberate. The Founding Fathers deeply feared popular democracy. They rigged the system to favor the elite from the start, something that has been largely whitewashed in public schools and by a corporate media that has effectively substituted myth for history. Europe’s poor, fleeing to America from squalid slums and workhouses in the 17th and 18th centuries, were viewed by the privileged as commodities to exploit. Slaves, Native Americans, indentured servants, women, and men without property were not represented at the Constitutional Conventions. And American history, as Howard Zinn illustrated in “The People’s History of the United States,” is one long fight by the marginalized and disenfranchised for dignity and freedom. Those who fought understood the innate cruelty of capitalism. As Noam Chomsky points out, the sentiment expressed by the Lowell millworkers predated Marxism. Our consumer society and celebrity culture foster a frightening historical amnesia. We chatter mindlessly about something called the “American Dream.” And now that the oligarchic elite have regained control of all levers of power, and that dream is being exposed as a cruel hoax, we are being shoved back into the cage. There will be hell to pay to get back to where we were. Slick public relations campaigns, the collapse of public education—nearly a third of the country is illiterate or semiliterate—and the rise of amoral politicians such as Bill Clinton and Barack Obama, who posed as liberals while they sold their souls for corporate money, have left us largely defenseless. 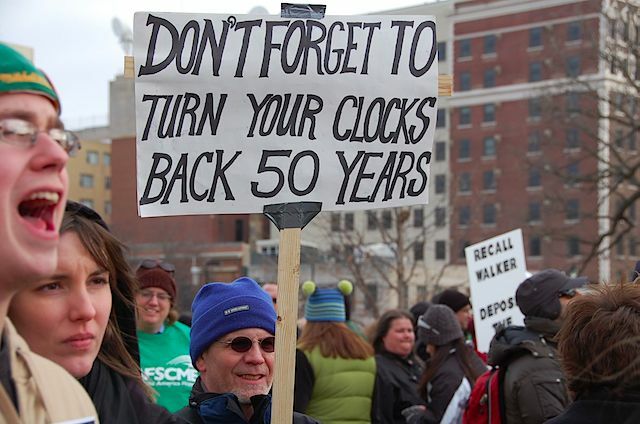 The last vestiges of unionized workers in the public sector are reduced to protesting in Wisconsin for collective bargaining—in short, the ability to ask employers for decent working conditions. That shows how far the country has deteriorated. And it looks as though even this basic right to ask, as well as raise money through union dues, has been successfully revoked in Madison. The only hope now is more concerted and militant disruptions of the systems of power. The public debate, dominated by corporate-controlled systems of information, ignores the steady impoverishment of the working class and absence of legal and regulatory mechanisms to prevent mounting corporate fraud and abuse. The airwaves are saturated with corporate apologists. They ask us why public-sector employees have benefits—sneeringly called “entitlements”—which nonunionized working- and middle-class people are denied. This argument is ingenious. It pits worker against worker in a mad scramble for scraps. And until we again speak in the language of open class warfare, grasping, as those who went before us did, that the rich will always protect themselves at our expense, we are doomed to a 21st century serfdom. The pillars of the liberal establishment, which once made incremental and piecemeal reform possible, have collapsed. The liberal church forgot that heretics exist. It forgot that the scum of society—look at the new Newt Gingrich—always wrap themselves in the flag and clutch the Christian cross to promote programs that mock the core teachings of Jesus Christ. And, for all their years of seminary training and Bible study, these liberal clergy have stood by mutely as televangelists betrayed and exploited the Gospel to promote bigotry, hatred and greed. What was the point, I wonder, of ordination? Did they think the radical message of the Gospel was something they would never have to fight for? Schools and universities, on their knees for corporate dollars and their boards dominated by hedge fund and investment managers, have deformed education into the acquisition of narrow vocational skills that serve specialized corporate interests and create classes of drone-like systems managers. They make little attempt to equip students to make moral choices, stand up for civic virtues and seek a life of meaning. These moral and ethical questions are never even asked. Humanities departments are vanishing as swiftly as the ocean’s fish stocks. The electronic and much of the print press has become a shameless mouthpiece for the powerful and a magnet for corporate advertising. It makes little effort to give a platform to those who without them cannot be heard, instead diverting us with celebrity meltdowns, lavish lifestyle reports and gossip. Legitimate news organizations, such as NPR and The New York Times, are left cringing and apologizing before the beast—right-wing groups that hate “liberal” news organizations not because of any bias, but because they center public discussion on verifiable fact. And verifiable fact is not convenient to ideologues whose goal is the harnessing of inchoate rage and hatred. 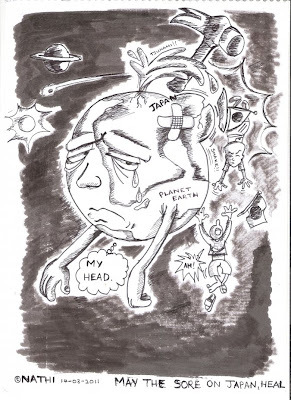 Artists, who once had something to say, have retreated into elite enclaves, preoccupied themselves with abstract, self-referential garbage, frivolous entertainment and spectacle. Celebrities, working for advertising agencies and publicists, provide our daily mini-dramas and flood the airwaves with lies on behalf of corporate sponsors. The Democratic Party has sold out working men and women for corporate money. It has permitted the state apparatus to be turned over to corporate interests. There is no liberal institution left—the press, labor, culture, public education, the church or the Democratic Party—that makes any effort to hold back the corporate juggernaut. It is up to us. We have tolerated the intolerant—from propaganda outlets such as Fox News to Christian fascists to lunatics in the Republican Party to Wall Street and corporations—and we are paying the price. The only place left for us is on the street. We must occupy state and federal offices. We must foment general strikes. The powerful, with no check left on their greed and criminality, are gorging on money while they busily foreclose our homes, bust the last of our unions, drive up our health care costs and cement into place a permanent underclass of the broken and the poor. They are slashing our most essential and basic services—including budgets for schools, firefighters and assistance programs for children and the elderly—so we can pay for the fraud they committed when they wiped out $14 trillion of housing wealth, wages and retirement savings. All we have left is the capacity to say “no.” And if enough of us say “no,” if enough of us refuse to cooperate, the despots are in trouble. Everyone has their beliefs as to how they fit into the world. However, only those who think for themselves, rather than blindly follow, will truly experience the real world. This animated tale is about one character's journey learning that lesson. NHK (TV) newscaster announced at 18:22 that the fuel rods of [ No.2] reactor of Fukushima No.1 plant had become almost all exposed out of water level. http://www.nisa.meti.go.jp/english/index.html admitted that it cannot deny the possibility that some fuel rods have melted, NHK says. But after a few minutes of this announcement, the NHK anchorman announced the follow-up that suddenly the continuing efforts of pouring seawater became effective ( 19:00), and some seawater was poured into the containment vessel. Then 19:50, some rods were in the water. But some must have been melted, so the situation is still very dangerous, NHK says. A lucky story is that all the reactors of Fukushima No.2 plant have become safe now, as the temperature in their containment vessels have decreased. This is because in this plant, electricity is on. It was announced early this afternoon that Prime Minister, who was supposed to go to the hard-hit areas to see the situation, would not go, as such areas might be desperate now, his visit might be cumbersome. Rep. Dennis Kucinich speaking to activists in Madison, Wisconsin. He connects the dots the way all elected officials and the public should be doing. Notice too how Kucinich uses emotion during his speech and note too how the crowd responds to this emotion. Like Michael Moore, Kucinich comes from the working class and understands that the people are fed up and want someone to tap the root of their justified outrage. One of the reasons the Tea Party has had such success is because they use emotion to mislead the angry working class. Kucinich offers real and positive solutions during this talk. 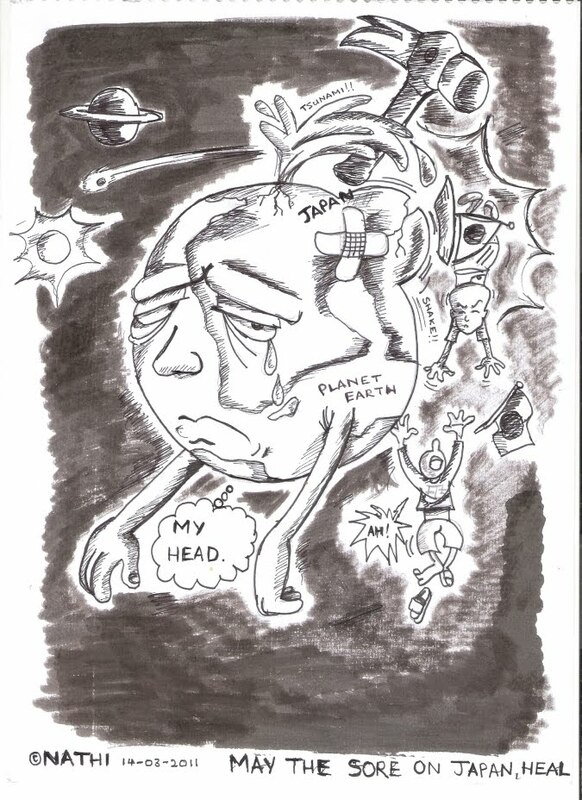 He uses emotion to guide people in a positive, cooperative and transformative direction. Music by the Life and Peace Fellowship as they remain in Gangjeong village on Jeju Island in South Korea giving support to the struggle against the Navy base construction.